It’s incredibly difficult to assess the impact of an electoral reform ex ante. The problem is that parties’ and voters’ strategies are endogenous to the electoral system. This is one reason why the analysis of electoral reform so often has to operate on the basis of first principles. However, given the vagaries of social choice theory (generally no equilibrium for 3+ options in 2+ issue dimensions), there are limits to what we can say on the basis of first principles. For this reason, it’s still useful (and interesting) to look at data to learn about the impact of electoral reform. The Spaniel is on record as preferring a “ranked ballot” electoral system – or the “Alternative Vote” (AV) as the system is known in Australia, where it has long been used at federal and state elections. With their majority, the Liberals can impose an AV on the country – and, as I have argued previously, they have strong incentives to do so. Theoretically, AV works to the advantage of large, centrist parties like the Liberals. Correspondingly, it (theoretically) works to the disadvantage of both smaller parties and identifiably left- or right-wing parties; the former are disadvantaged by AV’s use of single-member districts; the latter, by the fact that they are less likely to be the second-preference of many voters. The Australian experience with AV is quite unique; I know of no other major country that has had such long experience with AV. But that makes it problematic to draw inferences about how AV might affect Canadian politics: we can’t know which aspects of Australian electoral and party competition are due to the inherent dynamics of AV and which are due to Australia being, well, Australia. To get around this (but, to be honest, only part way around this), I examine elections in Australia’s five mainland states as well as in the Commonwealth. To the extent that trends are common across all 5 states and the Commonwealth, we can assume that that’s due to the (common) electoral system and not the peculiarities of the state. The Australian state data are especially useful because, like the Commonwealth, the five mainland states used FPTP before adopting AV. This allows one to assess the impact of transitioning from FPTP to AV within each state. Now, the transition was not always direct as Table 1 below shows: NSW experimented with a two-round plurality system (of the sort used for elections to the French National Assembly), STV, and the Contingent Vote before adopting AV; Queensland only adopted AV in 1963. In addition, FPTP was not always employed with single-member districts. South Australia applied both the plurality rule and the alternative vote in 2- and 3-seat districts. 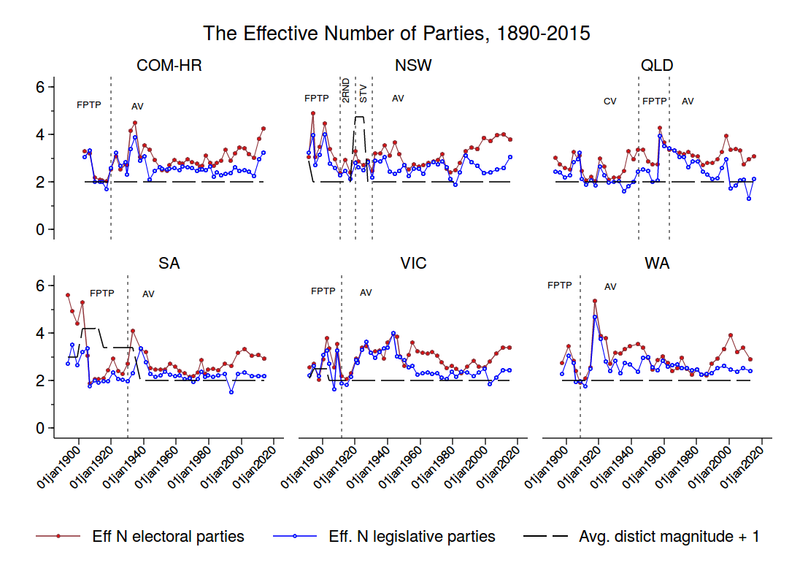 Figure 1 shows the effective number of electoral and legislative parties in the Australian Commonwealth and the five mainland states over time. These statistics provide a rough means to track the relationship between the electoral system and the party system. For example, we can use the data in Figure 1 to assess if changes to the electoral system precede sharp changes in in the number of parties that contest elections or win seats. From a theoretical perspective, one would not expect a shift from FPTP to AV to have a big impact on the effective number of parties. This is because both systems tend to be used in conjunction with single-member districts (i.e., districts magnitude = 1), and theory (Cox 1997) predicts M + 1 effective parties to contest elections. (And, because parties are unlikely to persist in contesting elections unless win at least some seats, to secure legislative representation, we might also predict M+1 legislative parties). The prediction is a weak one, however, because Cox’s M+1 rule operates at the district-level – and different sets of M + 1 parties could present themselves in different districts. Still, the dashed line in each panel of Figure 1 shows this M+1 threshold for each state. Between 1940 and 1980, South Australia’s party system closely adhered to this theoretical prediction, with just 2.5 effective electoral parties and 2.25 effective legislative parties. However, the main message of Figure 1 is that the effective number of electoral and legislative parties can and does wander from this M+1 equilibrium. Observe, for example, the growth in the number of electoral parties in the post-1980 period at both state and federal levels. Plainly this post-1980 increase in electoral parties is not due to the main features of the electoral system because by this point in time all mainland state and federal elections in Australia were held under AV. In addition, the effective number of electoral and legislative parties was pretty much the same under FPTP and AV controlling for differences in district magnitude. The effective number of electoral parties in each state and federally averaged about 3 (i.e., M + 2), and the effective number of legislative parties in averaged about 2.5 — and did so under both FPTP and AV. The results (below) indicate that 1) an increase in the district magnitude in year t increases the number of electoral parties by .34 in t and the number of legislative parties by .21 in t+1. In the next post, I’ll consider if/how the transition from FPTP to AV in Australia altered votes-seats proportionality. Under AV, voters (typically in single-member districts) rank their preferred candidates from 1-N. If any candidate secures 50+% of voters’ first-preferences, s/he is declared elected. If not, the lowest ranked candidate is eliminated and ballots cast for the eliminated candidate are distributed to the remaining candidates according to second-preferences. If any candidate secures 50+% of voters’ first- and second-preferences, s/he is declared elected. If not, the lowest ranked candidate is again eliminated and ballots redistributed, etc. Many thanks to my colleague, Campbell Sharman, for furnishing me all these data on Australian elections. The contingent vote (CV) is a hybrid between FPTP and AV: Under CV, the voter lists up to two preferences on their ballot, one for the most-preferred candidate and a second-preference for another candidate. If there is no majority-winner on first-preferences, then all candidates but the top-two are eliminated, and ballots cast for those candidates are redistributed according to second preferences. The winner is then the candidate with the plurality of first- and second-preferences. Using first-differences obviates the need to include state fixed-effects. Now, the model does restrict the coefficients to be the same across states, but there’s not really enough variation to allow for the coefficients to vary by state. 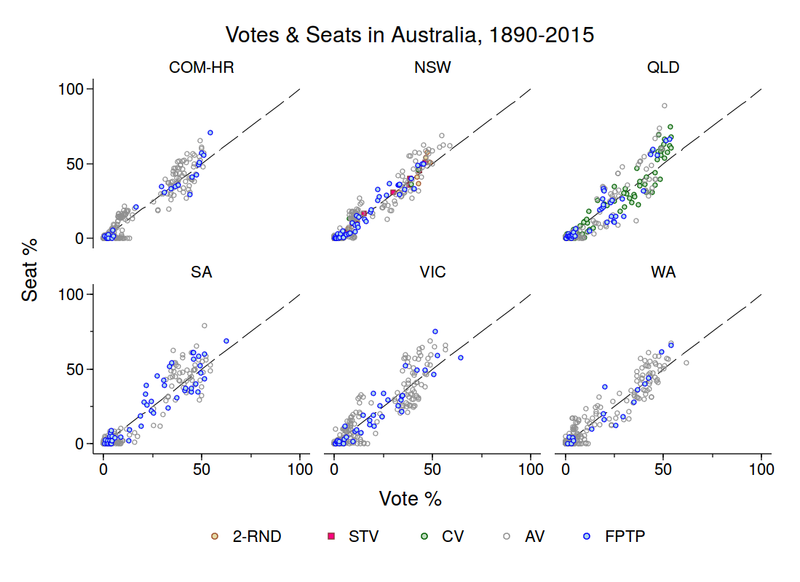 Also, it’s clear that changes in formula include shifts from say, STV to CV, as in NSW; they are not just confined to transitions from FPTP to AV. But the results are largely unaffected by, say, dropping NSW from the model. I have a great deal of respect for Coyne, who I think is the country’s best columnist right now, but – Ay Carumba! – these columns are exactly the sort of thing that I was complaining about (e.g., “false majorities”… there are no true majorities!). For that reason, I am reposting my “Logic, please!” post…. FPTP produces “false majorities.” This chestnut gets dragged out after the election of every majority government. A less pejorative term is “manufactured majority,” but that’s actually tangential to a more fundamental point: there are no “true” majorities in the sense that a majority necessarily reflects a transitive social ordering (save in the case of majority rule over 2 alternatives). That’s one implication of Arrow’s Theorem. What do I mean by that? Well, imagine three options, say, Liberal, Conservative, and NDP. It may well be that if we constructed a pairwise competition we’d have L>C, C>N, and N > L. So each option is majority-preferred at some stage. Which of these majorities is false? Well, in a sense none and all. To even label majorities “true” or “false” is utterly jejune. Look, any time we have more than 2 options and are voting over more than 2 dimensions (e.g., economic and social policy), we cannot rule out that there exists a voting cycle, and that the majority that emerges is pretty much a function of the agenda / voting system. And even if the majority were independent of the electoral system we used, we’d never know it. A byproduct of this line of argument is that claims about electoral mandates (“the election showed voters want us to effect policy X”) are claptrap. Indeed, I doubt on the basis of the theoretical work of Arrow, McKelvey, and Riker whether it makes any sense to talk of electoral representation (in the sense of a systematic link between the preferences of voters and the outcome of the election) at all – no matter what electoral system is employed. “Under FPTP, many people’s votes don’t count / are wasted”. This is another bromide. A vote is said to be “wasted” when it does not elect a winner. So you’ll often hear advocates of electoral reform talk about adopting voting systems under which all votes count. they’ll say. I can only infer from such claims that the speaker thinks that every vote cast under their preferred system will go toward electing a candidate, ergo, no votes will be cast for losers. But here’s the thing: Logically, we could only achieve this if we guaranteed ex ante that every candidate who ran would win. I can see only two ways to achieve this: a) ensure that only as many candidates are nominated as there are seats in the House of Commons, with all candidates elected by acclamation; or b) expand the House of Commons so that everyone who wants to be an MP gets to be one. (It would be even better, right, to have winners who did not even need votes?) Seriously, the first option (dictatorial control of the menu of options) is normatively undesirable, and the second is infeasible. Any time you have more candidates than seats, it will be that case… hold tight here… that some candidates will lose! I know, it’s shocking, but it gets worse: some people may actually vote for those losing candidates. This is true under any electoral system. It’s just that by layering on tiers and effecting panachage, various quotas, etc. some electoral systems obscure this fact. But, really, you can’t escape the plain fact that if you have more candidates than seats, some candidates will lose…(really, they don’t all get seats, no, no, not even in the Netherlands), and that is, in fact, healthy for representative democracy. Strategic voting occurs only under FPTP. Uh… no, that’s just not true. All voting systems save majority vote under two alternatives admit strategic behaviour. This is the central message of the Gibbard-Satterthwaite Theorem. This is not merely a theoretical proposition: Gary Cox (1997) demonstrated that desertion from “2nd loser” to the “1st loser” (consistent with people ditching their most preferred but hopeless option to defeat their least preferred option) under a wide variety of electoral formulas. The limiting factor appears to be district magnitude (i.e., seats per district): after M>5 this behaviour becomes harder to effect. BUT there other forms of strategic voting nonetheless emerge under various forms of PR even when M>5. For example, voters try to gauge if they should stick with their preferred party and risk it falling under the threshold or defecting to a viable coalition partner. Or voters may try to balance coalitional blocs (as Kedar suggested). Why one form of strategic voting (e.g., trying obtain a certain coalition) is normatively better than the sophisticated voting we observe under FPTP is beyond me. FPTP generates regional tensions: Ah, the old Cairns’ thesis. Let me make three observations on this point: 1) we don’t know whether Canada’s regional tensions are a function of FPTP or deeper socio-economic / spatial forces; 2) PR is hardly sufficient to undercut regional tensions: see Belgium, Spain and Italy for counter-examples; and 3) so any argument that PR would resolve Canada’s simmering regional tensions strikes me as incomplete; it’s not necessarily wrong, but such an argument cannot IMO be brought home on first principles. None of the above is an argument in favour of FPTP as such. It’s a plea for some coherent arguments predicated on logic that can withstand some cursory examination. After studying institutions for a long time, I am confident predicting that electoral reform will certainly change the identity of winners and losers and alter which political strategies are dominant; it may also have policy effects. But these effects are unpredictable; the effect of institutions will interact with the country’s social and economic context; and some of these effects will be negative. The NDP clearly hope to use the Liberals’ promise to effect electoral reform to replace FPTP with a mixed-member proprtional system (MMP). This is precisely what the NDP promised in its election platform (http://xfer.ndp.ca/2015/2015-Full-Platform-EN.pdf), and it is why the NDP have seized on the Liberal’s promise to make “make every vote count” (which is the same phrase used in the NDP’s platform). The NDP’s platform did not detail the MMP system the party hoped to install, and I suspect that the NDP have not thought through in any serious fashion about the impediments to installing MMP nationally. I set out these impediments in my previous post (e.g., the need to redistribute district boundaries whilst also respecting the senatorial floor clause etc. ), but the central obstacle to MMP at this moment is that the Liberals’ electoral interests are far better served by an alternative vote (AV) or single-transferable vote (STV) system. Seriously, what does the MMP give the Liberals that AV or STV does not… proportionality? How does proportionality serve the Liberals? Even were the NDP to get their wish of a “post-reform” referendum, they still confront a choice between STV, AV, and FPTP – because I see little possibility that MMP emerges as the alternative to FPTP. Observing Josep Colmer’s maxim that when it comes to electoral systems, “the large [parties] like the small [district magnitudes], and the small [parties] like the large [district magnitudes], one assumes that the NDP’s preferences over these alternatives are STV > AV > FPTP. I would assume the Greens hold similar preferences. A coalition of the large (Liberals and Conservatives) against the small (NDP and Greens). The first coalition could come together around a high-district magnitude STV system, but not around MMP. The second could come together around AV or low-M STV. The Conservatives actually have some leverage vis-a-vis the Liberals in the form of a (temporary) Senate majority. Even if the Liberals were to stack the Senate, the Conservatives could mount a fairly effective blockade of the legislation. Let’s say that the first coalition threatens to crystallize around high-M STV (or, due to some surprising event, around MMP), the Conservative could concede AV to the Liberals. This offer i) gets the Liberals exactly what they want with ii) the support of their main ideological opponent (all the better to rebut charges of self-interest), and iii) AV’s district magnitude of 1 preserves the disproportionality that that Conservatives need to do well; and iv) it removes electoral reform from the agenda for decades. To repeat, MMP just doesn’t serve the Liberals’ interests as well as AV or low-M STV. For these reasons (and especially the last), a coalition of the Large versus the Small seems more likely to me. All of this suggests to me that the NDP is in a tough position with respect to electoral reform. Even if they were to secure Cullen’s post-reform referendum, their best outcome under such conditions would be STV – and then electoral reform would be off the agenda forever. At worst, the NDP gets stuck with AV, and this is cemented in place by precisely the strategy that the NDP now champions. An alternative vote system is not necessarily a death knell to the NDP (they are capable of winning single-member districts), but it’s not particularly friendly to third-parties either. This is a point I’ll consider in an upcoming post on the dynamics of AV in Australia and the Australian States. * The only scenario where MMP makes it to a referendum ballot IMO is if the Liberals – intent on sinking the whole damn thing – present voters with a ballot that contains 3-4 alternatives to FPTP; support for electoral reform would splinter across said alternatives and FPTP would remain in place. I could also see the Conservatives backing this kind of proposal. ** When I use the term “coalition” here, I am using only in the sense that these actors find themselves on the same side of an issue. Argue for a referendum on two grounds: i) that the Liberals do not have a popular mandate to change the electoral system; and ii) that governments / politicians (of any stripe) ought not to be allowed to unilaterally change the rules of the game because they will invariably do so to further their interests and not the public’s. Threaten to use their Senate majority to block electoral reform unless the Liberals agree to put the question to a popular referendum. Is this strategy a cynical one? Absolutely, but no more so than Liberal claims that electoral reform is needed to ensure that “every vote counts” or Liberal counter-claims that the recent election did indeed confer on them a popular mandate for every item in their platform. All sides are – to paraphrase Elster – propagating hypocrisy dressed up as public service. How successful is this strategy likely to be? The Conservatives’ rhetorical strategy is certainly full of logical holes and contradictions (e.g., using an unelected branch of the legislature to block legislation passed by a duly elected government… though there is that John Turner episode that the Grits probably prefer not to talk about). But I think the Liberals are swimming against the tide here: 1) populism is deeply embedded in Canadian political culture; 2) perhaps as a result, we have a history of putting critical issues to plebiscites in this country – and no one argues that this is a mundane issue; 3) the BC and Ontario precedent is to use plebiscites to decide over electoral reform; 4) I just think the public mood in advanced Western democracies is no longer so deferential to elites; 5) the Conservatives don’t actually have to win this argument; they just have to make the process of electoral reform troublesome enough that the Liberals give up; and 6) given that most plebiscites fail, the Liberals may come to want the Conservatives to win this argument; it gives the appearance of living up to their promise while leaving in place FPTP (under which they’ve done very well, thank-you) . But the Tories shouldn’t get too comfortable: what if the Liberals to agree to a referendum, and then use their weight in committee and on the floor to ensure that the referendum was over the Alternative Vote (AV) (which the Liberals want) and, say, closed-list PR (which the Liberals know would lose)? Put differently, the Liberals can use their majority to determine what alternatives are put before the electorate… and they are under no obligation to put the status quo (FPTP) on a referendum ballot. So the Conservatives need a back-up plan. Presumably, that’s a Senate blockade regardless of how the Liberals proceed. But (as I’ll explain in an upcoming post), they have to be aware that the Liberals can and will stack the Senate it they are intent on electoral reform. So what’s the back-up, back-up plan? Clearly, FPTP is the Conservatives favoured electoral system; under FPTP, the Conservatives have recently (i.e., the last 15 years) been able to translate a vote share of approximately 33 percent into a series of minority and majority governments. Understand, however, that the Conservatives’ success under FPTP was due mainly to vote-splitting on the political left. When the political right was split between the Reform and Progressive Conservatives in the 1990s, FPTP worked to deliver the Liberals a series of majority governments. Thus, whilst the Conservatives might prefer to remain with FPTP, altering the electoral system to AV would not be the worst outcome. Under AV the district magnitude would remain at one, and this by itself would allow the Conservatives to remain as one of the two largest parties. Canadian electoral politics might then come to resemble a mirror-image of Australian politics, with the Conservatives taking on the role of the Australian Labor Party—often consigned to opposition but sometimes able to form government alone. One possible outcome of electoral reform, then, is for the Liberals and Conservatives to agree to replace FPTP by AV and to forestall any possibility of reform along more proportional lines that would threaten both of the large parties. Such an agreement would represent the two large parties tacitly ganging up to sideline the NDP and Greens. I don’t discount this possibility one bit. There is an alternative, however. The one advantage the Conservatives enjoy over the Liberals is that they are currently the lone viable party on the political right. This means that any reform, whether to AV, MMP, or STV, leaves the Conservatives in a similar position, that is, with a monopoly on the political right albeit consigned to (the official) opposition for long stretches. (That’s not so bad: the official opposition gets all sorts of perks.) Thus unlike the Liberals, who I see as having strong preferences for AV over STV and (especially) MMP, the Conservatives are much closer to indifferent over which of these alternatives prevails. (Put more formally, the Conservatives’ preference ordering is FPTP >>> AV >= STV, MMP.) This provides the Conservatives with two openings. First, this makes the Conservatives’ threat to stall electoral reform in both the House and Senate eminently credible. The Conservatives might be able to exploit the combination of their credible intransigence & the Liberals willingness to evade what may quickly become a quagmire to gain some say over the content of any referendum; they could then insist that any referendum be over all options: FPTP, AV, STV and MMP. Supporters of electoral reform might then fail to coordinate on an alternative to FPTP a la John Howard’s manipulation of the Republican referendum in Australia. Second—and this is more speculative—the Conservatives might credibly threaten to throw their support behind MMP. Why would this be credible? Well, on the argument above the Conservatives are largely indifferent over reform to AV or MMP—but the Liberals are not; the Liberals IMO strictly prefer AV to FPTP to MMP;* MMP will leave the Liberals as one of three left-wing parties, perhaps positioned as the natural left-bloc formateur, but never in a completely dominant position. And the risk of splitting into 2+ parties the face of PR is just as high for the Liberals as it is the Tories. Such a threat might then serve to force the Liberals to 1) put electoral reform to a referendum on the Tories’ terms, or 2) to give up on the project entirely. In short, the Conservatives’ one advantage in all this is that they can afford to be far more risk-acceptant than the Liberals over electoral reform; in some ways, the Tories just have much less to lose. * The wild card in all this for me is how the Liberals rank STV (in small-M districts) relative to FPTP. One view is that as the centre party in the party system, the Liberals stand to do better under any ranked-ballot system than any other party. A contending view is that the degree to which the Liberals benefit from a ranked-ballot system invariably declines in the district magnitude. This is because STV becomes increasingly proportional as the district magnitude increases. Clearly, there is some M beyond which the Liberals are better off under FPTP. It’s probably between 2-3 seats. At M = 2 (so a Hare quota of 33%+1), most districts would return 1 Liberal and 1 Conservative. **To appreciate this, note that the NDP exceeded 50% in only 2 districts last election, and received > 21% in only 140 districts last election; so give them +5% in the latter to account for the fact that the NDP’s vote % last election was sapped by strategic defection; these incentives will decline as M>1. But then divide 140 / 3 and the NDP makes the quota in just 45-50 M=3 districts. In contrast, the Conservatives exceeded 52% (i.e., 2 quotas at M=3) in about 40 districts, and the Liberals exceeded 52% in 112.